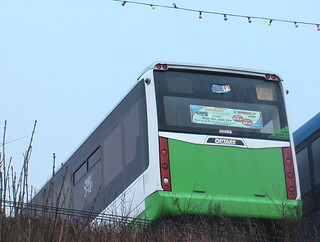 Duty Awaits: YJ06YRZ, one of three vehicles painted in TrawsCymru livery some time ago for the T5 service that has only just appeared. Each of these points probably deserve a post of their own, and I intend to do just that. How long it will take me to complete all that is another question. I am part way through the January 2015 issue of ‘Modern Railways’. On page 14, there is a piece hailing the success of Community Rail Partnerships. Over six years (2006/07 to 2012/13) they report an overall patronage growth across the regional passenger sector of the UK rail network of 23%. 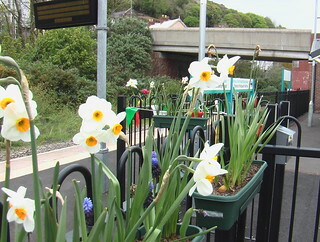 Within that though, the use of lines supported by Community Rail Partnerships grew by 45%. Further growth on many of the lines is apparently now being hampered by the national shortage of DMU stock. 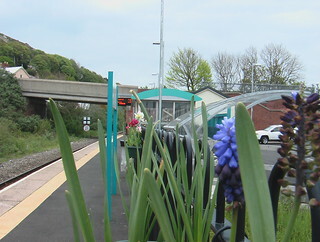 It is a shame then that one of Wales’ Community Rail Partnerships, the one covering the Pembrokeshire branches (including, if I recall correctly, the line from Swansea to Carmarthen) appears to have become defunct. It was called ‘All Points West’, but I noticed some time ago that their website URL now pointed to something totally irrelevant. 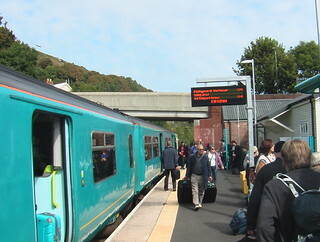 Arriva Trains Wales’ website still mentions ‘All Points West’ but they have since removed the hyperlink when they learned that the ‘All Points West’ site was gone. They obviously had no money for web hosting, and I don’t think they exist any more at all. They were, if I recall correctly, either part of or supported by SWWITCH, the South West Wales Integrated Transport Consortium. SWWITCH itself now appears to have gone the way of the dodo. There now doesn’t seem to be any single co-ordinated body promoting the rail network in the bottom left-hand corner of Wales, just a handful of independent, mostly informal, groups. In terms of promotion, as I remarked in one of my ‘Trains For Fishguard’ videos, it is a shame that the lines do not have a marketing name. 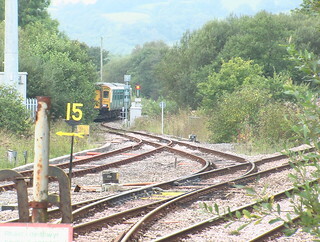 Another of Wales’ Community Rail Partnerships is a great example of the opposite end of the scale: ‘The Heart Of Wales Line’. That has to be one of the best marketing names out there, but south-west Wales has nothing. The best idea I’ve come up so far is to resurrect ‘All Points West’ as ‘LLAnBranches CRP’, the Landsker Line And Branches Community Rail Partnership. A bit of a mouthful, but the main route from Llanelli through to Clarbeston Road could be simply the ‘Landsker Line’ as it roughly follows the boundary between the areas where Welsh is spoken more (north of the line) or less (south of the line). Perhaps trying to bring about the ‘LLAnBranches CRP’ is something to add to my already stupidly long to-do list for 2015. I’m REALLY slow, so I might need 100 of me to get all my work done. In other words, it is unlikely I will get round to doing anything about it. 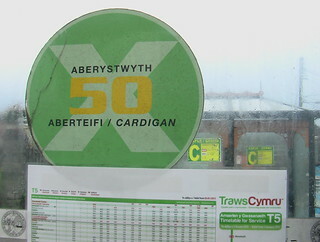 Still, at least I’ve managed a blog post to start the new year, and it wasn’t even the rant about the new TrawsCymru T5 service I’d expected to post, so that is still to come. I hope 2015 will be a happy year for you, me and the rest of life on earth.